I wrote about these beautiful shiny coils in a post last summer and have used them daily ever since. I also started getting my hair cut at Civello, the Aveda salon by my work on Queen St. W, and they carry the Hair Slinky brand in their boutique. These gentle, non-kinking, super strong hair ties are truly the best. I also received a luxuriously smooth satin pillowslip from La Vita Glam. Sleeping on a silky, satin pillowcase will keep your hair free from tangles, and can reduce skin wrinkles since it doesn't pull like cotton. It goes so well with my bedding, and feels smooth and luxurious on my skin and hair at night. How long can I go without washing my hair? If you asked me a month ago, I'd say one day. But I've changed! I'm trying to wash my hair at least every other day now that I'm growing it out a bit longer. I love the texture that I can get with second-day hair, and I'm always amazed by the power of dry shampoo when I pull my hair back in a pony on day three. 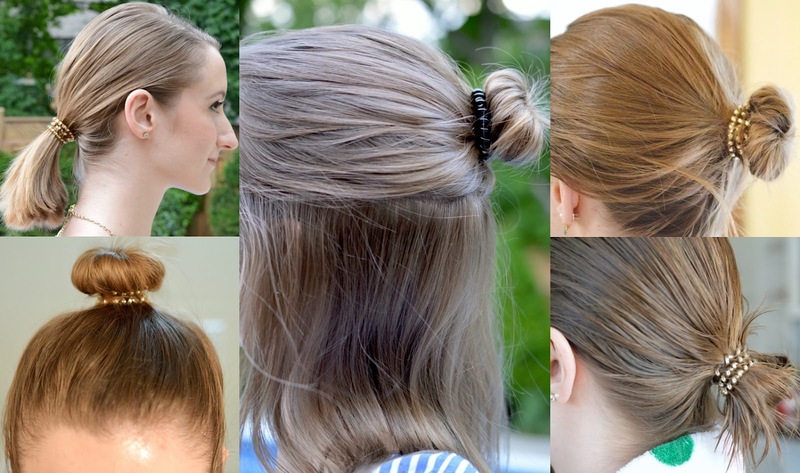 Has your Hair Slinky stretched out? Drop it in some boiled water, and watch it retract back to it's original shape. You can order your own Hair Slinkys online and they range from $4 - $8 cad each. They're the perfect addition to a birthday gift, Christmas stocking, or for inside your gym bag. How do you extend the life of your hair styles? I love the variety in these hair slinkies! There are so many different sizes. I want to try them!